Spring is on its way and for us, spring means flowers, rainbows, and bugs! We love simple crafts that let us explore the world around us and create fun projects. 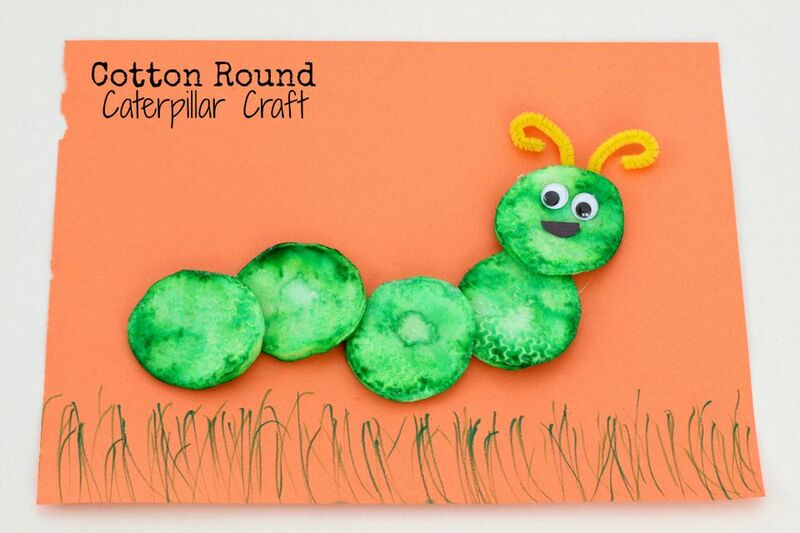 This cotton rounds caterpillar craft is a perfect spring craft for kids. Plus you may already have all the supplies in you craft closet and bathroom! Using droppers let kids color their cotton rounds with liquid watercolor. The cotton rounds absorb a lot of the liquid but if you have a little one that really likes to pour it on I’d recommend putting some newspaper under them. Working with droppers is a great way to strengthen fine motor skills and work on hand-eye coordination for kids. Plus they encourage kids to slow down and take their time on the craft. When your cotton rounds have dried it's time to glue them together. Grab your construction paper, arrange your cotton rounds into a caterpillar body shape, and then glue to construction paper. The next step is to cut out a mouth shape and gather some googly eyes and a pipe cleaner. Bend your pipe cleaner into an antennae shape and glue all the parts on the head to complete the craft. You can also use markers to create a habitat scene for your caterpillar. Add grass, leaves, clouds, and/or the sun! Whatever you want your caterpillar to enjoy. They look great displayed on your wall!